In my day job, I support a company that has extension mobility configured across many locations. We see a variety of problems that occur - mostly from misconfiguration (we didn't install it ). The following step-by-step guide is a great checklist if you're unsure about an existing extension mobility configuration, or if you are planning to install extension mobility for the first time. 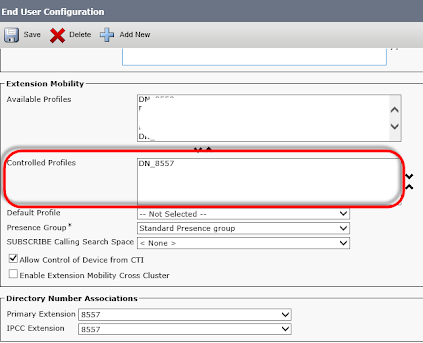 Note: I've also seen where multiple call managers are being used to register phones, however, the Cisco Extension Mobility Service is not active on all servers. Watch out for this. Under Phone URL parameters, change all fields from CCMNAME:8080 to IPADDR:8080. Change ONLY your existing server name to the correct IP address. Click Ok from the pop-up warning. From the drop down list, select the phone model to be configured, for example, Cisco 7960. Under Description, enter a description of this profile. Under Phone Button Template, select Standard 7960 SCCP. Choose Device > Device Settings > Device Profile and click Add New. Enter a Device Profile Name, for example “Your Name” . 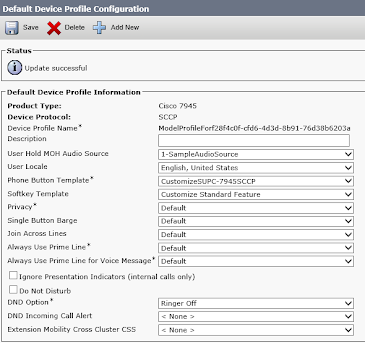 From the Phone Button Template field, select Standard 7960 SCCP. On the left hand side of the screen, click the link Line  – Add a new DN. 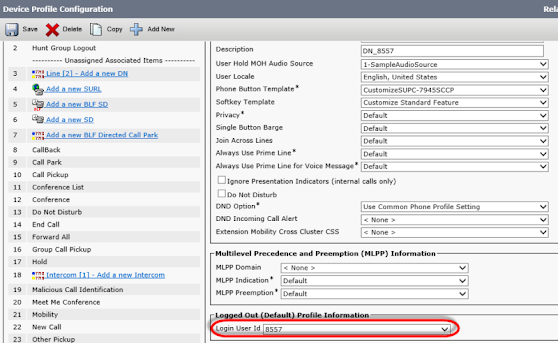 Choose a valid DN from your internal dialing plan for the location, enter that DN in the Directory Number field. Under Route Partition, select your city’s Headquarters Partition. Under Directory Number Settings choose a CSS of appropriate access. Enter any Call Forward and Call Pickup Settings as necessary. In the Display (Internal Caller ID), enter the User’s name. From the Related Links: menu, select Subscribe/Unsubscribe Services. 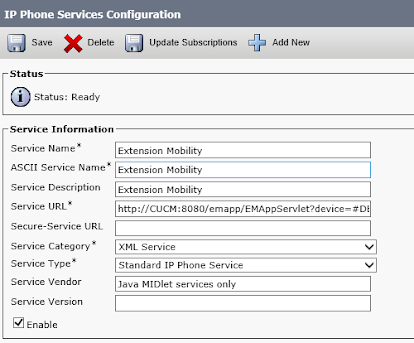 In the Select a Service, select Extension Mobility, then click Next. Repeat for any additional lines. From the menu, select User Management > End User. Select the user from the list that matches the profile that was created. Under Extension Mobility > Available Profiles, select the profile and move it to the Controlled Profiles selection. Under Default Profile, select the profile. Select Device > Phone from the menu. Select the phone from the list of devices. In the pop-up window, under Service Information, in the Select a Service pull down menu, select Extension Mobility. Under Extension Information, check the Enable Extension Mobility box. In the pop-up window select Reset.